Bring the classic ghost story to your game. "What lurks in abandoned houses and forlorn ruins? It's no random encounter. The monsters refuse to lair there, because there are haunts! "Exploring the realms of the Pathfinder Roleplaying Game, here are 30 Haunts to harass, frighten and antagonize adventurers. Choose from a selection ranging from the Lonely House to the Mumbling Malediction; these unquiet spirits provide interesting encounters of CR 1 to 15. There are bleeding walls, wells that lure the unsuspecting, doors that lock themselves and fires that start without a single spark. These ghostly locales and the special conditions necessary to resolve them bring the terror to your game like nothing else. "There's no need to settle for simple ghouls and wights. Why not show those treasure-seeking explorers just what the unfinished business of the dead looks like? Give them phantasms vomiting black bile, chains that threaten to strangle the air from their lungs, or jealous armor desperate for revenge. 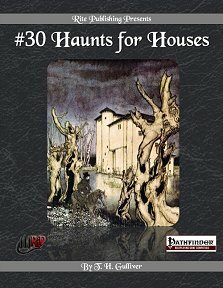 Give them anything but what they were expecting - give them #30 Haunts for Houses!"